Lemon Curd is a thick, soft, and velvety cream that has a deliciously tart yet sweet citrus flavor. While traditionally it was used as a spread for scones, it also makes a delicious filling or topping for tarts, pies, and cakes. What I like about Lemon Curd is that it doesn't use exotic ingredients; just eggs, sugar, lemon juice, lemon zest, and butter. It is similar to a lemon filling or custard in that it is cooked on the stove, only it doesn't contain a thickener like cornstarch. I like to cook the curd in a stainless steel bowl placed over a saucepan of simmering water (a double boiler) as this helps prevent the eggs from curdling. That is, where you get little specks of cooked egg in the lemon curd. However, if this does happen you can just strain the lemon curd to remove any lumps that may have formed. Once made, butter is added for richness and flavor, and lemon zest is added to enhance the lemon flavor. You will find that the lemon curd continues to thicken as it cools. Cover the lemon curd immediately with plastic wrap to prevent a skin from forming and it can be stored in the refrigerator for about a week. For the best flavor, lemon curd should be made with freshly squeezed lemon juice. When choosing lemons use organic if possible. Look for ones that are fragrant with brightly colored yellow skins. The best ones are firm, plump, and heavy for their size. Don't buy lemons that have blemishes, soft spots, or are hard and wrinkled. Lemons consist of a yellow outer rind (skin) that can be of varying thickness and graininess, and can have either a bumpy or a smooth texture. This outer skin is where most of the lemon's wonderful tangy flavor is located. Before removing the outer rind (zest) make sure you wash the lemon thoroughly (soap and water is best). When removing the zest do not remove the white membrane (pith) that is underneath as it is very bitter tasting. Once you have removed the outer rind, inside the lemon are small vessels called 'pulp vesicles' which contain the pleasantly acidic lemon juice and seeds. Squeezing the lemon by hand or with a lemon squeezer or reamer releases this clear tart juice. 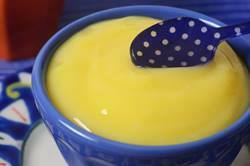 Lemon Curd: In a stainless steel bowl, whisk together the eggs, sugar, and lemon juice. Place over a saucepan of simmering water and cook, stirring constantly to prevent it from curdling, until the mixture becomes thick (like sour cream) and coats the back of a wooden spoon (165 degrees F) (74 degrees C). This will take approximately 10 minutes. Remove from heat and immediately pour through a fine strainer to remove any lumps. Cut the butter into small pieces and whisk into the mixture until the butter has melted. Stir in the lemon zest. Cover immediately so a skin doesn't form, and let cool. The lemon curd will continue to thicken as it cools. Lemon Curd can be stored in the refrigerator for up to a week. Makes about 1 1/2 cups (360 ml). Note: If you want a lighter lemon curd whip 1/2 cup (120 ml) of heavy whipping cream and fold into the lemon curd.